Take a front-row seat and witness the filmmaking magic that brought J.K. Rowling's script for the Academy Award R-nominated Fantastic Beasts and Where to Find Them to the screen. Return to the wizarding world and discover how director David Yates and producer David Heyman brought J.K. Rowling's all-new adventure, the Academy Award R-nominated Fantastic Beasts and Where to Find Them to the big screen. Step inside the world of the talented art departments who, led by Academy Award R-winning production designer Stuart Craig, were responsible for the creation of the unforgettable characters, locations and beasts in J.K. Rowling's Fantastic Beasts and Where to Find Them. 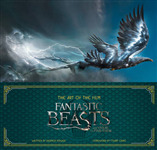 Explore the Academy Award R-nominated Fantastic Beasts and Where to Find Them in this intricately illustrated black & white gallery of characters and scenes from the film and designs used in its making, which is officially licensed by Warner Bros. Consumer Products.